Even with modern prevention and treatment advances, losing teeth in later life is still a sad but common part of human experience. Just as generations have before, many today rely on dentures to regain their lost dental function and smile. But although effective, dentures have their weaknesses. The most serious: they can't prevent jawbone deterioration, a common problem associated with tooth loss. Bone health depends on chewing forces applied to the teeth to stimulate replacement growth for older bone cells. When teeth are gone, so is this stimulation. Dentures can't replicate the stimulus and may even accelerate bone loss because they can irritate the bone under the gums as they rest upon them for support. 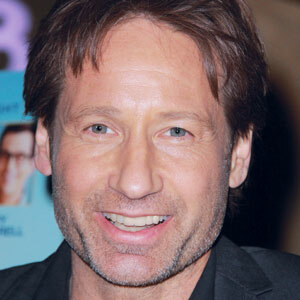 But there's a recent advance in denture technology that may help slow or even stop potential bone loss. The advance incorporates implants with dentures to create two hybrid alternatives that may be more secure and healthier for the supporting bone. The first is known as an overdenture, a removable appliance similar to a traditional denture. 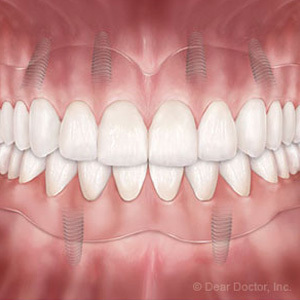 But instead of deriving its support from the gums alone, the overdenture attaches to three to four implants (or only two, if on the lower jaw) that have been permanently set into the jawbone. This not only increases stability, but the implants made of bone-friendly titanium attract and foster increased bone growth around them. This can help slow or even stop the cycle of bone loss with missing teeth. The second type is a fixed denture. 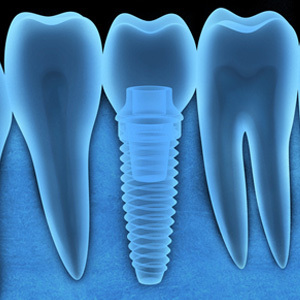 In this version, four to six implants are implanted around the jaw arch. 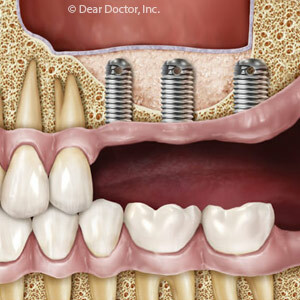 The denture is then secured in place to these implants with screws. It's a little more secure than the overdenture, but it's also more expensive and requires good quality bone at the implant sites. If you've already experienced significant bone loss you may first need bone grafting to build up the implant sites for these options, or choose traditional dentures instead. 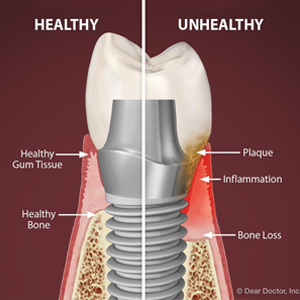 But if you're a good candidate for an implant-supported denture, you may find it provides better support and less risk of continuing bone loss than traditional dentures.